2019 ©Takashi Kunitani All Rights Reserved. Photo by Tsuyoshi Saito. Installation view of "Courtesy : Contemporary Art Center, Art Tower Mito". 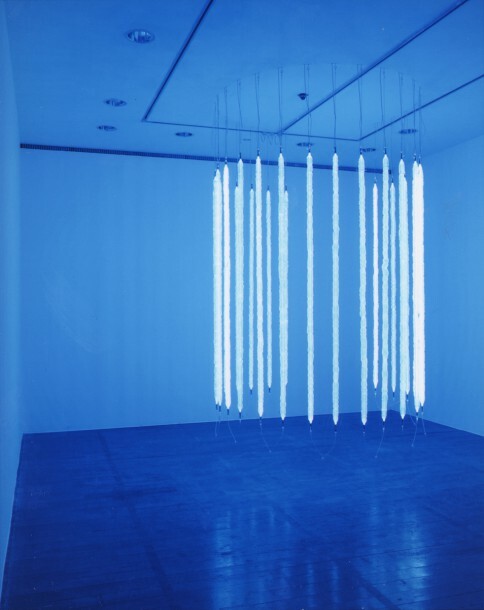 Twenty-four neon tubes hanging in a circle are radiating a soft, pale glow. The color obtained by blending argon gas and mercury in the vacuum of a glass tube is a natural color produced by electrical discharge. 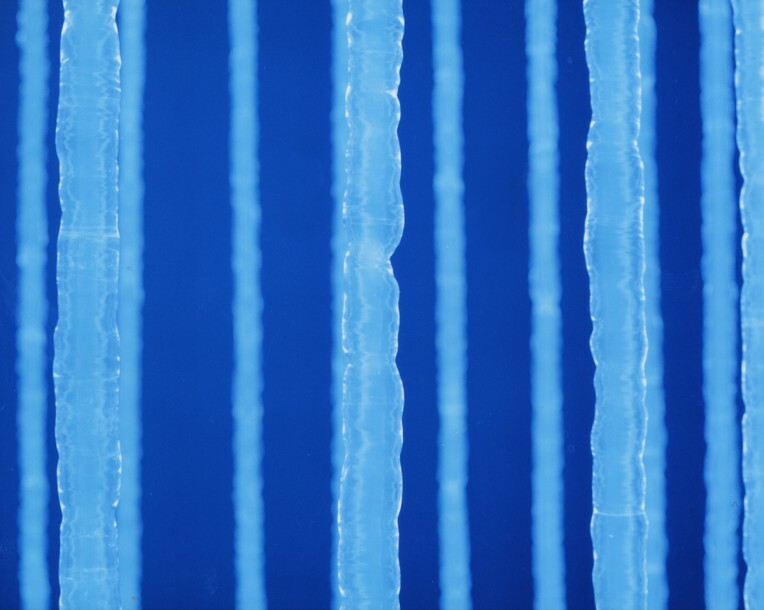 When he graduated from college, Kunitani Takashi went to work at a neon tube factory to actually learn firsthand the making of neon tubes. 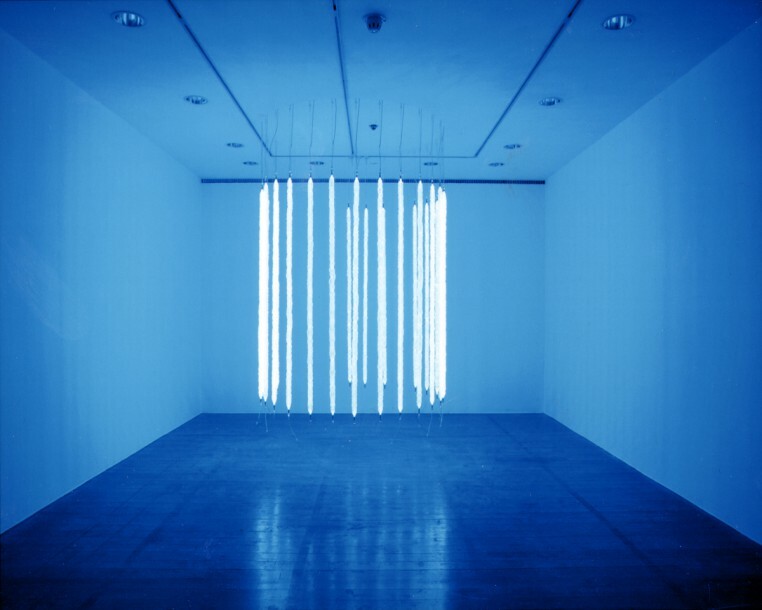 Although it was not until 1998 that he started to create works using neon tubes, there was an encounter with glass in the process that led him to neon tubes. When he had casually drawn a picture on a sheet of glass and looked at it from the other side, he discovered the all-too-obvious fact that the reversal of viewpoint results in a gap or difference in how we see a picture. His works in 1998 were installations of neon tubes with alphabetical letters and mirrors. When alphabets are made with a neon tube, the letters are reversed in a mirror image. “Iconic Image” (1998) was a work that had adopted this characteristic. It was an allusive piece of work, since when the neon tube that spelled out “eil” was reflected in a round mirror, it could be read “lie”. “Raccoon” (1998) was that of a neon tube with the letters “evil”, which when reflected in a mirror changed to “live”. The mirror was attached to a stuffed raccoon that moved back and forth on a rail, so that the letters “live” was not reflected in the mirror unless the raccoon came to a certain spot. The room was fitted with iron bars like a prison cell, and it was designed so that the visitor was as though looking out at the artwork from his/her cell. It was a work that provoked a change in the viewer’s standpoint and awareness. The characteristic of evoking the visitors’ awareness became more prominent with “Complete your Space” presented in 2001, as he discarded the alphabets, which carried a strong message, and discarded minimalist installations. 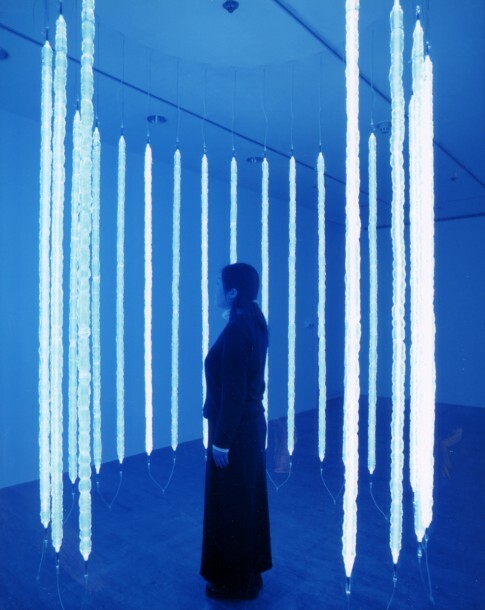 With the installation in which a row of neon tubes hanging from the ceiling cut across a room, Kunitani made the visitors distinguish between the inside and outside of a space. The entire space that was touched by the neon tubes was the artwork. At the present exhibition, Kunitani has created a new environmental piece, in which he has hung glass tubes from the ceiling in equal distances in a circle with an opening, where the visitor is able to enter inside the cylindrical form. Unlike the inorganic neon tubes as industrial products that flood the streets, he creates glass tubes that are physical and organic by blowing them into shape himself. The row of glass tubes that give off a pale glow might look like icicles because of their shape and color, but the natural shape produced by the chemical reaction within the glass tubes feels warm, and readily induces the viewer’s diverse responses. The title “Spaceless Spaces” implies space that is occupied and yet not occupied, and space that expands endlessly. Could it be that display space created by Kunitani is evoking a change in the quality of space, which is affected by the physical and psychological responses of the visitors who step inside it? Though they sit quietly, his works penetrate into the minds of the visitors and give life to the environment.